Storm Captain Ronnie Attard has been named the USHL Defenseman of the Week following a record-breaking performance this past weekend at the Viaero Center. Attard netted four goals in Friday’s 7-0 win over Green Bay, tying the Storm’s record for most goals scored in a game, and setting a new team record for most goals scored by a defenseman in a single game. This the third time this season that Attard has earned Defenseman of the Week honors. 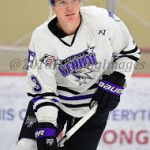 The Storm open up a three game road swing this week with games at Central Illinois and Waterloo.